I haven’t had a ton of time to read over the last month, but this weekend I actually spent time lounging and reading! It was glorious. 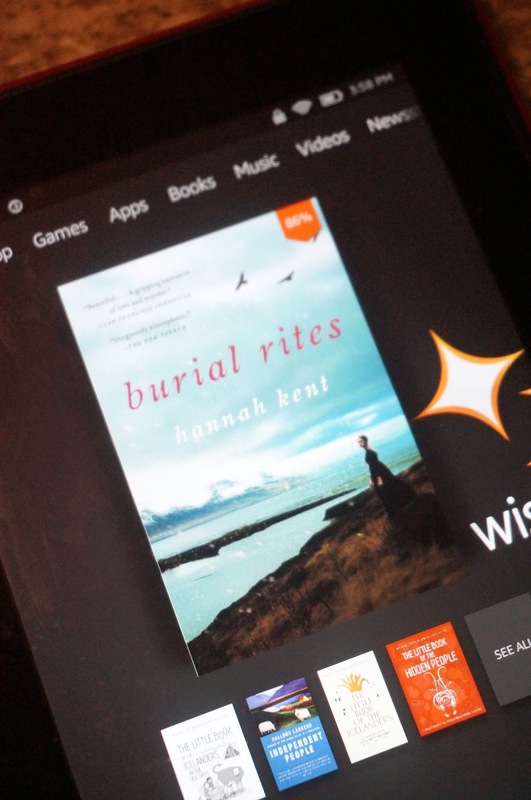 I had started this book, Burial Rites by Hannah Kent, a while ago and finally finished it this weekend. This debut novel is set in 19th-century Iceland. It follows Agnes, who has been charged with murder of her master Natan. She has been given the death penalty, along with her supposed accomplice Fredrik. Prior to her execution, she is sent to an isolated farm to live. The farmer, his wife, and their daughters are terrified to house a convicted murderess in their house. At first, they ignore Agnes. A local priest, Toti, was assigned to Agnes to make her repent her sins before the execution. Toti slowly gets to know Agnes, as does the rest of the family. As the story progresses, they learn more and more about the circumstances surrounding the murder. They learn that there is always more than one side to a story. I thoroughly enjoyed this book, even though the premise was dark. Kent’s writing style is fabulous and atmospheric. I can imagine the island of Iceland, as bleak and cold as she makes it seem in the book. If you love historical fiction, then you will absolutely love this book. There is an extra layer that all historical fiction fans will find interesting. This book is based on an actual murder and execution that took place in Iceland. Agnes was a real person, and she was the last person to be executed in Iceland. Kent speaks about all her years of research into the case at the end of the book. It is all so interesting and, like I said, adds another layer to the historical fiction that I enjoyed. Have you read Burial Rites? Is it something that you would read?